For more than a century, education providers throughout the United States have strived and struggled to meet the diverse needs of American children and families. A complex system of biases and structural inequities is at play, deeply rooted in our country’s history, culture, and institutions. This system of inequity — which routinely confers advantage and disadvantage based on linguistic background, gender, skin color, and other characteristics — must be clearly understood, directly challenged, and fundamentally transformed. The New York State Education Department (NYSED) has come to understand that the results we seek for all our children can never be fully achieved without incorporating an equity and inclusion lens in every facet of our work (see also New York State’s Every Student Succeeds Act (ESSA) Plan). This understanding has created an urgency around promoting equitable opportunities that help all children thrive. New York State understands that the responsibility of education is not only to prevent the exclusion of historically silenced, erased, and disenfranchised groups, but also to assist in the promotion and perpetuation of cultures, languages and ways of knowing that have been devalued, suppressed, and imperiled by years of educational, social, political, economic neglect and other forms of oppression. Each principle is illustrated by a set of features rooted in elements of quality education that illustrate how CR-S might look in practice across a range of domains, from the State Education Department to the classroom. The framework represents an opportunity for stakeholders to continue to work together and plan for the unique needs of their communities. The New York State Education Department recognizes much of this work is already happening across the state and looks forward to an even deeper understanding of culturally responsive-sustaining education in New York State schools, districts, and communities. This framework reflects the State’s commitment to improving learning results for all students by creating well-developed, culturally responsive-sustaining, equitable systems of support for achieving dramatic gains in student outcomes. 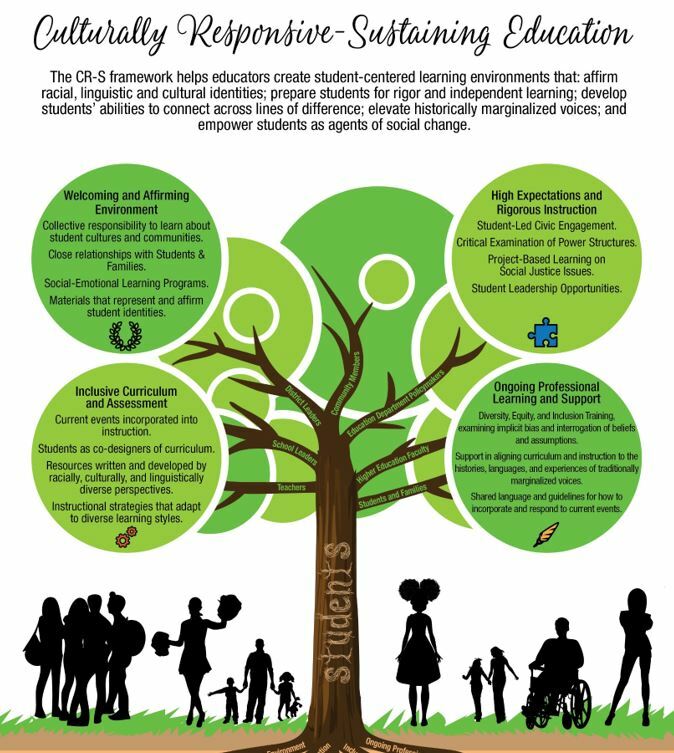 The 4 principles that organize State Education Department’s CR-S Framework were inspired by the 4 high leverage strategies that emerged from Buffalo Public School’s work on Culturally and Linguistically Responsive Education.